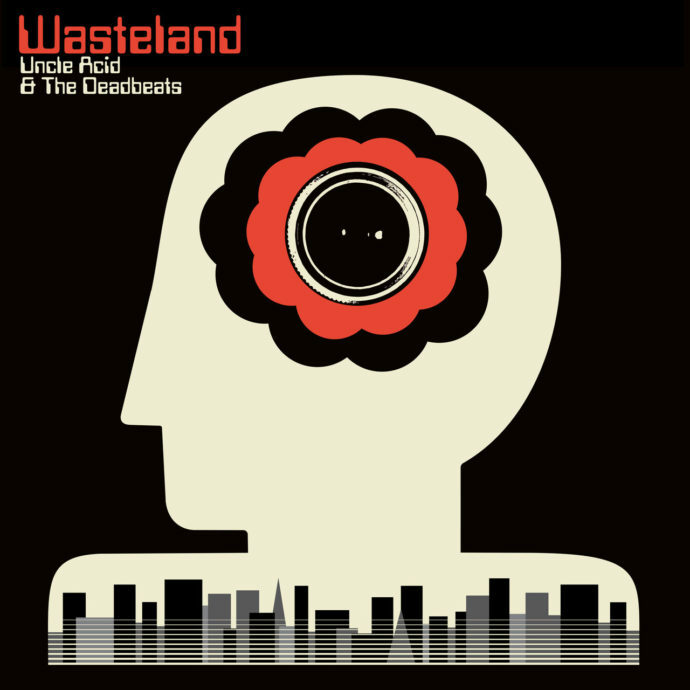 On their fifth full-length album, Wasteland, British psych-metal outfit Uncle Acid & the Deadbeats deliver eight riff-heavy stoner jams imbued with apocalyptic doom and retro horror themes. You’d be hard-pressed to name five other bands working in this genre who do it quite as well or as authentically as guitarist/vocalist Kevin A. Starrs and his crew. Fortunately, for lovers of ominous, energetic, intense UK metal with a distinctly 1970s feel, over the last eight-plus years Starrs and company haven’t been lacking in inspiration or motivation, and Wasteland is no exception. With no foreplay or pretense, Uncle Acid & the Deadbeats bring the listener into their world immediately. Analog atmospherics, an eerie organ, and an echoey newsfeed emerge before fading mere seconds before bone crunching guitar riffs crash in and the band drops the swaggering “I See Through You”. “Somebody hold them all to account and un-corrupt our minds, somebody raise their voice from the din and let the past rewind,” Starrs sings in his idiosyncratic, almost Dalek-like malevolent tone. The riffs just keep on coming with the pedal-to-the-metal “Shockwave City” and “Blood Runner”, a pair of twin pounders separated by a near nine-minute breather in between titled “No Return”, a gloomy number you could imagine Vampirella strutting around to. Side two of Wasteland opens with “Stranger Tonight” which, with its percussive piano and climbing chord progression, comes across like a lost Misfits B side. The album’s epic seven-plus-minute title track follows and slows things down considerably. Utilizing acoustic guitars and a lush string section, Starrs’ ballad about the apocalypse is at once horrifying and beautiful. Wasteland’s penultimate moment arrives in the form of “Bedouin” which takes a distinctly different approach instrumentally by employing a retro organ and a poignant brass section, the latter of which fitting surprisingly well. The psychedelic “Exodus” brings things to a close. The track’s fine solo guitar work enters and then re-enters and puts a nice cap on things before the record concludes with a creepy collage of static, nightmarish keyboards, warlike drumming, and a ghostly wind blowing through. Uncle Acid & the Deadbeats never break character. The band’s blend of fetishistic retro-creepiness, tough as nails riffage, and analog instrumentation and recording techniques create a sound world of absolute and total listener escapism. Wasteland is a winner for any metal fan who likes their bands to consistently deliver equally in terms of both imagery and artistry.